Chicago Bicycle Accident Lawyer | Illinois Bicycle Lawyers at Keating Law Offices: Can Mayor Emanuel's "Chicago Forward" Plan Eliminate All Traffic Fatalities? Can Mayor Emanuel's "Chicago Forward" Plan Eliminate All Traffic Fatalities? Mayor Emanuel has recently announced the "Chicago Forward" Plan under which the Mayor aims to eliminate all traffic fatalities within 10 years. For the bicyclists of Chicago, the agenda also aims to reduce by 50% of all injuries sustained in Chicago in bike accidents within 5 years. Objectives like these certainly fall under Chicago architect Daniel Burnham's advice of "Make no little plans." Statistics compiled by the Chicago Metropolitan Agency for Planning (CMAP) show that in 2009 2650 out of the total reported bicycle accidents statewide of 3255 occurred in the Northeastern region of the state. 11 out of the 20 statewide fatalities occurred in NE Illinois. In 2010, 2922 out of the 3599 total reported crashes statewide occurred in NE region. Of the 24 total fatalities, 17 were in NE Illinois, accounting for 70% of the state total. NE Illinois also accounts for 65% of the state’s total population. The analysis can be further condensed by comparing how the City of Chicago fares with the rest of the NE region, which includes the counties of Cook, DuPage, Kane, Kendall, Lake, McHenry, and Will. 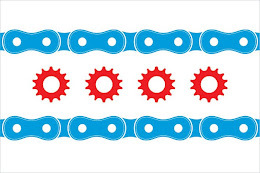 In 2009, Chicago accounted for 1460 of the 2650 bike accidents in the combined NE region. In 2010, Chicago accounted for 1625 of the 2922 total reported bike accidents. Such numbers would seem obvious given the high population density of Chicago in comparison to the other areas of NE Illinois. And while Chicago Forward reports that roughly 1% of Chicago’s population commutes by bicycle, that percentage will increase given proper execution upon the high aims outlined by Mayor Emanuel and the Chicago Department of Transportation. For more information on how the city hopes to become a safer place for all its locomotive citizens, you can read up on the action agenda here. If you have any questions regarding this post or an issue involving Illinois personal injury law, please contact Illinois Bicycle Attorney Mike Keating at 312-208-7702 or MKeating@KeatingLegal.com 24 hours a day, 7 days a week. All emails and phone calls are returned promptly. All initial consultations are confidential and free and the attorneys are available to come to your home or work to meet with you. *The post on www.IllinoisBicycleLaw was written with the research and assistance of Paul Min, Legal Intern at Keating Law Offices.